Despite the hemming and hawing, the Andean Trade Promotion and Drug Eradication Act was extended by the U.S. Congress for another 10 months. Democrats had pushed for longer, but Republicans want it tied more to passing a Colombia FTA. I take this to mean that if no FTA is passed this year, the Republicans (I assume in the Senate, given the ability to prevent a vote, though maybe there are also enough wavering Democrats in the House) will block the next renewal. But, of course, that means passing a new and controversial FTA in the midst of a presidential campaign, which itself is occurring the context of a sluggish economy, during which voters are naturally going to be even more leery than usual of trade deals. This is just from a short news story—who knows how many more would be in the original transcript. I’m glad to see that intelligence dollars in the U.S. remain so well spent. What else do we have no evidence of? I write on behalf of the organizations listed below to urge you to lift the restrictions that you imposed on academic and family travel, as well as remittances, to Cuba in 2003 and 2004, in recognition of Cuba’s first presidential succession in nearly 50 years and as a way to increase U.S. contacts with Cuba as it now begins a transition to a new generation of leadership. First, we should not view the transfer of power from one old dictator to his equally non-democratic brother as anything but dynastic succession, so this is not something deserving “recognition.” Second, given the old guard choices made by the political elites on Sunday, there is no “transition to a new generation,” at least not as of now. Instead, the letter should have emphasized that the restrictions strengthen the Castro regime and hurt the average Cuban, and as such are counterproductive and isolate the United States unnecessarily. Yes, we should increase contacts, but that should occur whether or not there is any "transition." Alvaro Uribe’s Foreign Minister says the president is willing to talk to Hugo Chávez, and that Colombia would really like the Venezuelan Ambassador to return to Bogotá. I’ll be interested to hear Chávez’s reply, because his opponents believe he wants to use enmity with Colombia for his own benefit. Some sort of rapprochement with Uribe would deflate that argument. My impression is that they don’t like each other much personally, but friendliness is not a precondition of diplomacy. This can work in Chávez’s favor in another way, because the United States likes to use the Venezuela/Colombia tiff as a means of criticizing Chávez. Smoothing the rough edges between the two leaders (to the extent possible) would also deflate that to some degree. Uribe, meanwhile, will be able to retain good relations with the U.S. while opening up talks with Venezuela about border problems. A hostile neighbor definitely does not benefit Colombia. So let's see what the Venezuelan response is. Made you look. Raúl is officially the new president. Rep. Howard Berman (D-Calif.), the acting chairman of the House Foreign Affairs Committee, announced in a statement he would hold hearings to determine what impact Castro’s retirement could make on the island. Apparently Democrats also have what they believe are strong candidates running against the South Florida embargo stalwarts. They are well entrenched, so I have no idea how realistic the challengers’ chances are. 'Obama said that as president he'd meet with the imprisoned island's new leader `without preconditions,' '' McCain said. ``So Raúl Castro gets an audience with an American president, and all the prestige such a meeting confers, without having to release political prisoners, allow free media, political parties, and labor unions, or schedule internationally monitored free elections. I take this to mean that McCain will also refuse to meet with the leaders of countries like China and Saudi Arabia, where they are not doing all the same things that Cuba is not doing. Oh, I forgot, those countries are not on the State Department's State Sponsors of Terrorism list so that means they're OK. In my U.S.-Latin American relations class yesterday, we discussed Fidel’s retirement, and a student asked if this would change the issue of Cuba being on the State Department’s State Sponsored Terrorist list. I remembered that Cuba was on there for harboring members of the FARC, but my student Kelby emailed me about the various other reasons. This isn’t new, but I hadn’t paid much attention to the rationale, which makes for some weird reading. Nowadays only Iran, North Korea, and Cuba are on the list. Gadaffi is a good guy now, so Libya is off. Sudan is said to be cooperating and so is not a full member of the list anymore either—no, I swear I did not make that up. Genocide, apparently, is not state sponsored terrorism. But I digress. --So Cuba is a state sponsor of terrorism because it speaks out against the U.S. By the way, since when did “War on Terror” become All Capital Letters? Since the Iraq War is part of that, then I suppose much of Western Europe must also be in this category. --I take it that Russia should also be on the list. --I guess the U.S. must also be on the list, since we harbor Luis Posada Carriles and refuse to extradite him. Oddly enough, the report mentions him and fails to see the irony. Instead, it uses that case to claim Cuban hypocrisy. BTW, the report also notes that “Venezuela is the only nation certified as "not fully cooperating" that is not a state sponsor of terrorism.” The next of these terrorist reports will likely be in April. You know many in the Bush administration want to get Chávez on that list. Will they realize that doing so would be so blatantly political that it would likely only help Chávez? This deserves my very first poll—check out the side bar. I can't imagine they are the worst in the entire world, though. In their annual address to the Utah legislature, the state’s two senators (Orrin Hatch and Bob Bennett, who were on opposite sides of McCain-Kennedy) predicted that Congress would likely not address immigration reform for at least another five years. As I take it, the upshot is that the issue is just too difficult, so we aren’t going to bother. The abdication of responsibility never ceases to amaze. Nonetheless, it is interesting that McCain is now going to be the nominee, despite all that pandering that Romney et al did by making a big deal about immigration. People are simply not as worked up about immigration—even illegal immigration--as the media makes it seem. So Fidel has resigned the presidency of Cuba, and is retiring, thus making official what had become de facto. Here is the official statement published in Granma (they seem not have translated it into English quite yet). He will now be a “soldier of ideas” who will continue writing his “Reflexiones” column. You have to admire the way Fidel and Raúl have managed this long transition, which has been amazingly smooth and has consistently kept their enemies off balance and guessing while still still reassuring their supporters in Cuba. Trivia question: how many dictators step down to become journalists? As Boz notes in a new comment to last week's post, Hugo Chávez has backed off his threat to cut off oil exports to the United States, but rather said that such an outcome would occur if the United States attacked Venezuela. I wonder whether he will refrain from making that same threat again. A brief break from Latin American politics to remind everyone that baseball is back. Padres pitchers and catchers have just reported to spring training and the first game is February 29. Finally! Am I the only one who thinks the “body language expert” analyses are rather annoying? With Roger Clemens on 60 Minutes and in Congress, these experts have analyzed every lip licking, shoulder shrugging, head bobbing and ear scratching. I wonder if my students can use this to determine if I am lying in lecture. The Padres will be playing in China next month. I find this very cool in theory, but hope it does not generate injury in addition to good will. I read Cait Murphy’s Crazy ’08, the story of the 1908 baseball season, when after an intense pennant race (and a famously disputed game when Fred Merkle failed to touch second base) the Cubs won the World Series. Great book for anyone into baseball history. Further down, however, the article also notes that Ortega is sending Nicaraguan soldiers to WHINSEC, formerly called the School of the Americas, even though he believes that it was tied to torture in the past. Last October Bolivia announced it would no longer send soldiers (if you’re interested, see my post, which includes comments from WHINSEC staff). Ortega did not explain why he approved the training, but said he would try to ensure officials did not turn into "torturers and killers." The current Ortega incarnation is really pretty fascinating. 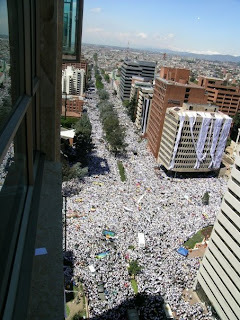 Adam Isacson has a great discussion about the anti-paramilitary violence march planned for March 6 in Colombia. At first glance, the idea seems uncontroversial, but then the Uribe government denounced the idea, saying it was planned by the FARC. Gaviria’s words are terribly unfortunate. Not only does a top Colombian government official reject the March 6 protests, he alleges that its organizers, the National Victims’ Movement, are indistinguishable from the FARC. This is the worst sort of slander, and the Colombian government must not let it stand. I've been sick and am now trying to catch up on a million tasks and emails that I've been neglecting. Back soon. So we have a string of relatively recent threats but no actions taken. Chávez may be painting himself into a corner with this combination of escalating rhetoric and inaction. Capitalism is thriving in Venezuela, but in large part because investors and business owners believe their private property to be safe. Acting upon all those threats would cause a serious ripple effect. On other hand, not acting on them makes him more and more like a paper tiger, in a domestic environment in which the opposition is feeling stronger after the defeated constitutional referendum. Thinking through Hugo Chávez’s recent threat to cut off oil exports to the United States, which he has made numerous times, it seems like a strategic mistake to make a threat that isn’t credible. Even the markets largely ignored him. I can’t help but think there is a crying wolf angle to this situation. Unfortunately for Chávez, Venezuela remains heavily dependent upon the United States, which despite rhetoric has not changed significantly since Chávez first took office. Cutting off exports would hurt Venezuela much more than the United States, which would exacerbate already existing domestic political tensions. Making threats you cannot follow up on ultimately leads to being ignored and taken less seriously, which then weakens Chávez politically. If he carries it out, I will eat my words, but it is hard to imagine. Update: I hadn't seen Boz's post, which makes a very similar argument. On Monday I mentioned that the U.S. Ambassador to Colombia would be answering questions submitted by email. I had been thinking of a potential question but then, I have to admit, I completely forgot about it. For your edification here are the questions and answers he gave. They start off with a questioner who cannot spell “Colombia.” Then they move to some really hard hitting stuff, like what college major you should have to enter the foreign service, what travel warnings exist, how much visas cost and whether he likes being ambassador. To be fair, he does take questions about human rights, including one asking about government abuses, but even then the answer moves off to how great the FTA would be, and how U.S. exporters would benefit. We can all feel good that he really likes being ambassador, though. Many thanks to Russ Bither-Terry from Rulablog, who invited me to come to the UNC-Duke Consortium Latin American Studies conference—yesterday’s sessions were at Duke. This is a great example of what blogging can do. I would never have known Russ otherwise, and would not have attended without him. Not only did I get to meet him in person, but also got to see some old friends as well (since I got my Ph.D. at Chapel Hill). The day’s panels ended with Ariel Dorfman, who gave the keynote address. I had not met him before, but yesterday had the opportunity to chat with him a few times, and to tell him I use his play Death and the Maiden in my Latin American politics class. If you have not read the play, you should (you can also watch the movie with Sigourney Weaver et al, but I didn’t think much of it). Dorfman’s talk really centered on the idea of telling the truth. At the end, he read the article (“Letter to an Unknown Dissident”) he published in February 2003, shortly before the Iraq invasion. Here is a copy I found online. I had not read it before, and it is really powerful. As he said in his talk, it has the potential to anger everyone. But it is the truth as he sees it, as someone who was hunted by a dictatorship and anguished about what to do. The latest Adimark poll puts Michelle Bachelet’s approval rating at 43% for January, down two points from December (but up from November). They tend to get slightly higher results than CERC, but still pretty close. All polls show her stuck in neutral. Her last cabinet shuffle was just last month, but I really doubt it will resonate in her approval. We're now past the halfway mark in only a four year term, so with each passing month political recovery becomes more and more remote. Thanks to Ana-Isabel, a Colombian student of mine who sent me some photos emailed to her by friends back home. She also gave me this link to more photos at El Tiempo. In all, impressive stuff. An active duty Chilean army general, Gonzalo Santelices, has resigned because he was implicated in the Caravan of Death (for a great book on that topic, see Patricia Verdugo’s Chile, Pinochet, and the Caravan of Death). Commander in Chief Oscar Izurieta praised him for retiring, which takes the scandal out of the active ranks (there is, however, a fund for officers who need lawyers in human rights cases). Nonetheless, such a quick army response is positive, and there are no longer the typical “close the ranks” responses from the army. Under questioning by a judge, Santelices had acknowledged that as a young lieutenant in October, 1973, he followed orders and transferred 14 prisoners from a jail in northern Chile to a desert area where they were executed by firing squad. He said he did not take part in the executions. However, there is an interesting twist. The presiding judge in the case said he believes General Santelices bears no criminal responsibility. Given his age at the time, as someone who just graduated from the Military Academy, he would have quite possibly been shot had he not obeyed the order. Gutierrez said Santelices directly participated in the killings because "he selected the 14 victims, handcuffed and blindfolded them and then took them in an army truck" to the execution site. If you are a family member of the one of the handcuffed, blindfolded, and ultimately murdered victims, then the issue of criminal responsibility is not so vague. We'll have to wait and see what the current judge decides. Daniel Ortega met with State Department and DEA officials in Nicaragua and announced he is “committed” to the war on drugs. An interesting angle is that he wants to affirm Nicaraguan control over islands/waters claimed by Colombia. * He brought up the issue with the U.S. officials, emphasizing that patrolling for drugs will require going beyond Colombia’s claimed boundaries. Ortega is doing quite the balancing act. There aren’t many presidents who will chat it up with Hugo Chávez one week and the DEA the next. There also aren’t many presidents who would try to use the U.S. to get something out of Colombia. *Interesting case, since the argument is that when Nicaragua signed agreements in the late 1920s, it was occupied by the U.S. and therefore the agreements are invalid. This is similar to the arguments Cuba uses about Guantánamo. The U.S. Ambassador to Colombia, William Brownfield, will answer questions about U.S.-Colombian relations submitted online. His answers will be posted on Friday. 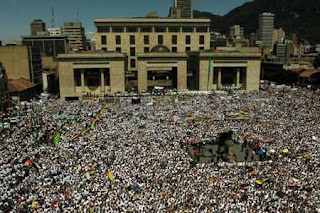 The Associated Press has a story about today’s Facebook-led global “One Million Voices Against FARC” march (which includes a noon meeting in Charlotte—I would consider checking it out but have class at the same time) and how it reveals some of the splits within Colombia about how to deal with violence and even who exactly to protest. 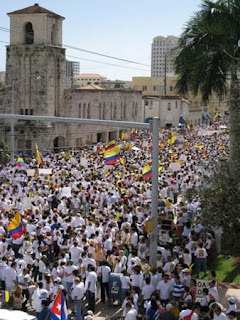 In particular, the Democratic Pole will hold a separate rally to protest all violence, including the paramilitaries. 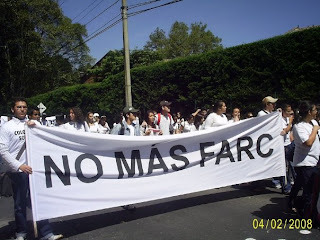 Families of hostages also do not support the protest, saying it should be pro-freedom and not simply anti-FARC. Meanwhile, the FARC wants Hugo Chávez back into the mix and so has announced they will release three hostages who are in poor health. Everything is fine as long as the FARC continues to release people without conditions but it’s hard to see the situation improving much otherwise. And so the question becomes: does all of this change anything or do we remain on square one? According to Clarín, Thomas Shannon (Asst Sec of State for Western Hemisphere Affairs) will soon visit Argentina as part of a broader strategy to strengthen U.S. ties with the country and put the Maletagate scandal to the side. Cristina Fernández de Kirchner seems to be playing this very well. On the agenda will be Argentina’s desire to renegotiate its debt without being forced to sign an agreement with the IMF. I suspect that the U.S. will make that work. It’s like a Latin American non-aligned movement, where governments can play the two antagonists off each other, benefiting from both. But the U.S. benefits as well. There is nothing to be gained by alienating Argentina, and much to be lost. Just basic signs of diplomacy—so long missing—can go a long way. I ran the UNC Charlotte Homecoming 5K this morning, a fun race through campus that I do every year. Unfortunately, there were too many good runners in their 30s so I won no prizes (small races with limited competition are really my only hope of placing). It was a good opportunity to see all the new construction in parts of campus I don’t get to very often—we’re growing very rapidly. Rebecca Weitz-Shapiro, “The Local Connection: Local Government Performance and Satisfaction With Democracy in Argentina.” Comparative Political Studies 41, 3 (March 2008): 285-308. Abstract: In light of extensive decentralization in much of the world, analyses of citizen satisfaction with democracy that treat citizens as subjects of their national governments alone are incomplete. In this article, the author uses regression analysis of unique survey data from Argentina to explore the relationship between local government performance and citizen satisfaction with democracy. She demonstrates that there is indeed an important link between local government performance and citizen system support but also that citizens distinguish between qualitatively different types of government performance. Certain measures of local government performance, such as corruption, have ramifications for citizens' evaluations of the functioning of their democracy and even for citizens' faith in democracy per se. At the same time, other types of local government performance, such as local bureaucratic inefficiency, do not reverberate beyond the local sphere. These results suggest mixed implications for future democratic stability in Latin America. So local government performance plays a very important role in determing an individual’s support for democracy (i.e. Tip O’Neill’s “All politics is local”) but not all local issues are of the same magnitude. She also differentiates between support for the country’s democratic institutions and democracy in the abstract. Merely getting bad service (measured here with the variable long line) probably upsets local residents, but the results shown in Tables 1 and 2 suggest that this alone is unlikely to alter a resident’s evaluation of how her government works or her democratic beliefs. At the other extreme, local government corruption seems to decrease an individual’s satisfaction with how democracy works in her country and is even capable of shaking her faith in democratic government. In between, substantively important (but not criminal or morally questionable) government behavior such as poor information provision is correlated with how a citizen evaluates her government’s performance but not the value she places on the principles underlying that system of government. This made me wonder about a slightly different line of inquiry that would be worth an empirical study: what aspects of local government performance affect presidential approval ratings? Which local variables most/least affect an individual’s perception of a particular president, as opposed to democracy writ large? To some degree—I am not sure how much—this could help explain persistently high approval ratings in the face of national scandal, but perhaps also dropping approval even when the national scene is free of serious problems. We would also have to control for whether the party of the local government was different from that of the president.